Live-cell imaging is a non destructive method which focuses on the observation of live cells and is widely used in cellular biology research and biomedical industry. This short review will present some technical aspects and challenges encountered in this field. Nowadays, the most widely used cell culture system is the static culture, where the cells are cultivated inside Petri dishes or multiwall plates. In static culture, the culture medium is supplied in a batch-wised manner. Static cell culture systems have the advantages of being economical and easy to use. But in term of long-term cell culture, they present important flaws. The first drawback is the high risk of contamination caused by the repeated manual interventions. The second one is the fluctuation of the cell environment due to the medium replacement process. Need advice to choose perfusion plateform? Compared to static cell culture, perfusion culture provides a more sterile environment and a more stable culture environment thanks to the continuous nutrient supply and waste removal. This allows more quantifiable cell environment. Perfusion culture also allows long-term study under microscope. With live-cell imaging techniques, it is critical to be able to replace culture medium without opening the perfusion chamber in order. Moreover, perfusion culture is an important tool for 3D cell culture. The goal of 3D cell culture is to obtain a microenvironment mimicking as closely as possible the in vivo microenvironment. Indeed, in their native environment, cells are submitted to various biological and physical cues, such as cell-cell interactions, signalling molecules and mechanics of the surrounding extra cellular matrix. 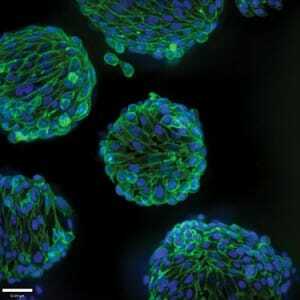 In 3D cell culture, cells are seeded on a 3D scaffold material. This scaffold makes difficult manual interventions such as medium changing. Perfusion systems can thus be useful to overcome this issue. Perfusion cell culture is certainly more challenging than conventional static cell culture, but allows to have a more precise control over cell microenvironment, which makes it an interesting tool for a wide range of biological applications. Perfusion cell culture systems can be used both with traditional perfusion chambers or microfluidic chips. Perfusion chambers are widely commercially available. They are generally specifically designed for live imaging. In order to perform perfusion cell culture, it is required to choose closed configuration chambers with fluid lines. Dedicated chamber holders can be found, allowing to use several chambers at the same time. For more information about perfusion chambers for imaging, see our dedicated short review. 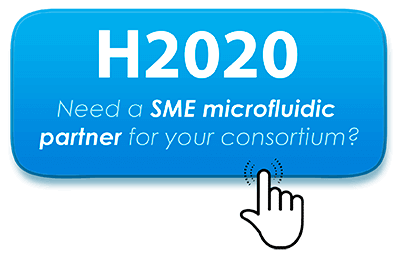 Microfluidics is currently a promising and growing field for cell culture applications. Specific physical phenomena occurring at micrometer scale, such as the creation of laminar flows and concentration gradients, can be used to precisely control the microenvironment of the scale. Simple and robust microfluidic systems for cell culture under perfusion are commercially available, and a growing number of researchers are focusing on designing specific microfluidic chips for cell culture in 2D or 3D. For more information about microfluidic perfusion cell culture, see our dedicated review and the bibliographic resources at the end of this review. One critical aspects of a perfusion cell culture system is the choice of the fluid delivery method. Several types of pumping mechanisms are available. 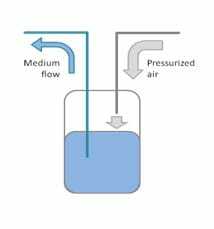 The principle of this technique is to apply a controlled flow of air inside a reservoir containing the perfusion medium in order to create a pressure-driven flow. The main advantage of this method is that it results in a very stable, pulse-less flow rate, even at very low flow rates. In a peristaltic pump, the fluid is contained inside a flexible tube fitted inside a circular pump casing. A rotor, equipped with several rollers, turns and the roller compress the tube, forcing the fluid to move though the tube. 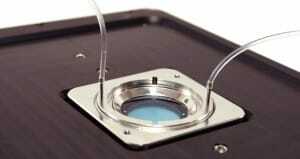 One advantage of this technique is that peristaltic pumps can be miniaturised and integrated inside microfluidic chip to obtain autonomous perfusion cell culture systems. However, this type of pump is not able to generate a very stable flow rate, especially at low flow rates. In a syringe pump, the fluid in held inside a syringe and a motor apply a pressure to a syringe plunger. 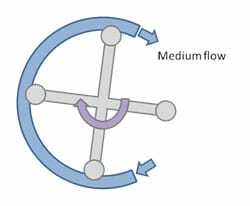 This method is very effective to deliver small volume of fluid but, as peristaltic pump, is not suited for stable low flow rates. Two different perfusion modes can be used: recirculating or non-recirculating. In recirculating mode, a given volume of culture medium is recirculating throughout the perfusion system. It is used in order to keep the molecule secreted by the cells in the culture medium. If cell-cell chemical communication is not essential to the experiment or if these chemical cues have to be ruled out, non-recirculating perfusion can be used, allowing to permanently remove secreted factors and waste products. Hydrodynamic shear stress can be a limiting factor for perfusion cell culture. In order to eliminate its effects, it is possible to lower the perfusion flow rate. Some studies have demonstrated that the minimum shear stress shown to affect differentiation or proliferation when applied continuously is about 0.5 N/m2. On the other hand, some experiments take advantage of the phenomena, by using high level of shear stress to investigate for example endothelial cell function or cell adhesion. Another way to reduce shear stress is to use microfluidic chips with dedicated geometries, such as microfluidic chips including a porous membrane acting as a barrier for the medium flow. Temperature is a critical parameter of the cell environment for long-term studies on live cells. 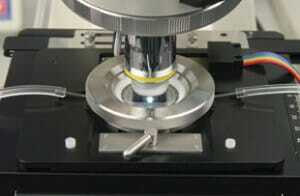 Several temperature control systems designed to be used while performing live-cell imaging are commercially available. 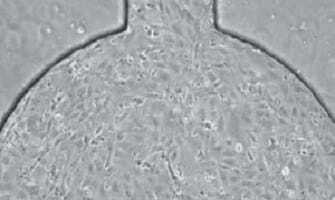 Air bubbles have a strong detrimental effect on cell culture. First, bubble trap inside tubing or microfluidic channels can obstruct fluid flow. Then, bubbles are known to kill cells at their gas-liquid interface. A good way to eliminate bubbles is to apply a high flow rate inside the perfusion system prior to seeding the cells. A soft surfactant medium, like SDS is very effective to release air bubble from perfusion chamber. II. How to choose your perfusion chamber and perfusion system ? A wide range of perfusion chambers are commercially available. Live cell imaging experiments can be performed with conventionnal perfusion chambers, microslides or microfluidic chips. Depending on your experiment, some chambers will be more suited to your needs. Don’t hesitate to read our review about perfusion chambers for more technical information about the different types of perfusion chambers, and to check our short overview of the different perfusion chambers commercially available. Again, the choice of a perfusion system depends on the type of experiment. For simple live cell imaging experiments, syringe or peristaltic pumps can be used. For experiments requiering more control over the cells environment, perfusion systems allowing to inject at very low flow rates, or to switch beteween different media or reagents are available. Don’t hesitate to contact us, our team of fluidic specialists will help you choose the system that best fits the need of your experiment.